Iran's parliament is expected to impose a ban on vasectomies and tighten abortion rules, and to restrict access to contraceptives. The moves are part of a stated drive to raise the country’s population from 77 million to 200 million. Two separate bills are being considered by the country’s parliament. One, meant to increase fertility rates, will ban surgeries intended for permanent contraception, except in cases involving serious threats to women's health. Strict punishments will be imposed on doctors found to be involved in such surgeries after the proposed ban. State funding for birth control programs, which previously provided subsidies for modern contraceptives, will be abolished. The new legislation marks the sharpest turn yet away from Iran's previous birth control policy, dubbed: “Two children is enough.” The move comes after the country’s supreme leader, Ayatollah Ali Khamenei, said in a televised speech in 2012 that Iran's existing family planning was an imitation of western lifestyles. The supreme leader has repeatedly urged Iranians to help increase the country's population, which he described as aging. "If we move forward like this, we will be a country of elderly people in a not too distant future," Khamenei said in October, according to the semi-official Fars news agency. "Why do some [couples] prefer to have one … or two children? Why do men or women avoid having children through different means?" the Iranian leader wondered. Although nearly 70 percent of the country's 77 million people are under 35 years of age, the population growth has been slowing. 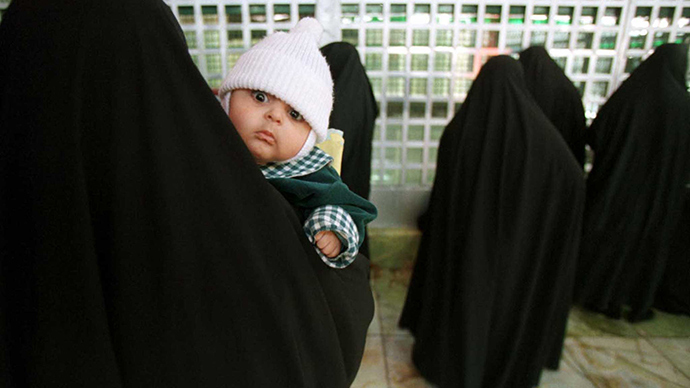 Iran's birth control program offered subsidized vasectomies, free condoms and low-cost contraceptives. There were educational programs on sexual health and family planning. Two proposed laws "pose a major threat to the human rights and fundamental freedoms of women and girls in Iran," Amnesty International has warned in its report. It said the bills are being considered by the authorities at a time when the female population is "already suffering increased discrimination and violence." According to the human rights group, there's been a steady decline in the country’s fertility rate – from 7.0 births per woman in 1980 to 5.5 in 1988, 2.8 in 1996 and 1.85 in 2014. "The Bill to Increase Fertility Rates and Prevent Population Decline threatens women’s right to sexual and reproductive health," Amnesty warns. The World Health Organization (WHO) has meanwhile questioned the assumption that restricted access to contraception necessarily leads to increased birth rates. In countries where abortion is restricted, women are forced to resort to illegal practices, risking their lives. According to the WHO, the first step for avoiding maternal deaths is to ensure that women have access to contraception and safe abortion.